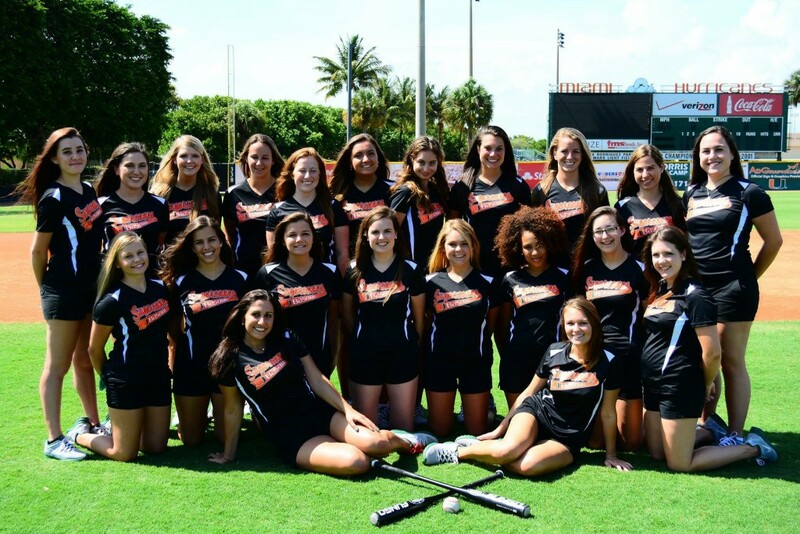 The Sugarcanes, a group of female students at the University of Miami who serve as batgirls for the Hurricanes baseball team, are stuck somewhere between a student organization and an athletic group. Not officially affiliated with the Committee of Student Organizations sponsors or housed under the athletic department, the Sugarcanes have created their own identity. “We feel like our own team,” freshman Annie Cappetta said. The Sugarcanes get a workout every game, running from the dugouts and retrieving bats and balls for both teams. Senior and president Suzanne Ghannam came into the group her freshman year. She grew up watching Canes baseball, and both her mother and uncle attended UM. 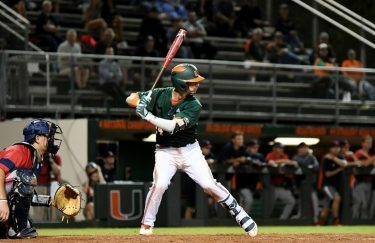 “It was like a family tradition for me to go to the University of Miami,” Ghannam said. She had been coming to the games since she was two or three years old and grew up seeing the Sugarcanes, telling her mother that’s what she wanted to be. Ghannam’s dream was close to becoming reality freshman year, when she saw the group recruiting at CanesFest. She signed up and was put on the interest list before the 2012 season. However, the group was almost forced to disband in 2011 amidst the NCAA investigation, when booster Nevin Shapiro was busted in a Ponzi scheme and blew the whistle on violations in Miami Athletics. The Compliance Office underwent changes during the investigation that lead to a decision to disband Sugarcanes. Ghannam and others on the interest list were told a couple of weeks before interviews that Sugarcanes would be replaced with Little League batboys towards the end of fall 2011. Several season ticket holders complained to athletics and even wrote to President Donna E. Shalala to bring back the Sugarcanes. Athletics reversed the decision and told the organization that they could come back, but members could not fundraise. The group had no more power to choose uniforms or go on away game trips. After the NCAA setback, Ghannam had to fight to become more involved without conflicting with compliance. Most importantly, Ghannam learned that persistence and dedication are necessary to be a leader. The Sugarcanes spend a lot of time together in the dugouts during the long baseball seasons, so a love for and knowledge of the game are essential to be part of the organization. “You have a different perspective watching it in the dugout and watching it so close, when you can hear the coach make the calls and you can hear the players say certain things that are happening in the game,” Ghannam said. In 1968, former Hurricanes baseball coach Ron Fraser founded the Sugarcanes to fill the need for retrieving foul balls from the stands. As the group grew in prominence, they took on a marketing role as well. As the first group of collegiate batgirls nationally, they paved the way for other universities to have similar programs. The Sugarcanes have seen a rise in recruitment numbers over the past four years. Last year, they had 35 people try out and had to turn down 10 girls. This season, they held a full day of interviews with 50 applicants and were forced to turn down 20 girls. Vice president Virginia Boies also got involved after Canefest which has served as a main source of recruitment for the group. The group accepts about 25 to 30 girls for each season. Every fall semester, new Sugarcanes apply and are interviewed by a panel including Head Coach Jim Morris and Director of Baseball Operations Robert McDaniels. They are asked questions to evaluate their baseball knowledge and to ensure that they girls are there for the right reasons. Because the girls work so closely with the baseball team and athletics, the Sugarcanes have implemented a no fraternization policy. “Our freshman year they made them sign a no fraternization contract,” Ghannam said. The Sugarcanes, as women involved in the sport, are subject to a lot of scrutiny so it is important to be selective for the good of the group. “All the hard work we are putting into it, and we’ve built it up so much we don’t want one girl to tare down the reputation,” Ghannam said.